United Gosus (UG) members have come together from every corner of the globe because they want to redefine success in competitive Yu-Gi-Oh!. If success in competitive Yu-Gi-Oh! was simply about winning a lot of Premier championships, then we would not exist today. Our collaboration of individuals have traveled the world, accomplished a long list of accolades including every single current and defunct Premier title there is. They have meet, competed against, interacted with, and worked with some of the most remarkable people, across all walks of life, from Los Angeles to Paris to Tokyo. They have shared many great experiences with new and old friends alike, created large followings, developed and utilized their unique skills in a professional atmosphere, have grown as a competitors and have ultimately grown as individuals. Success for us is about an endless pursuit of creating memorable experiences that will last a life time in the greatest hobby there is. 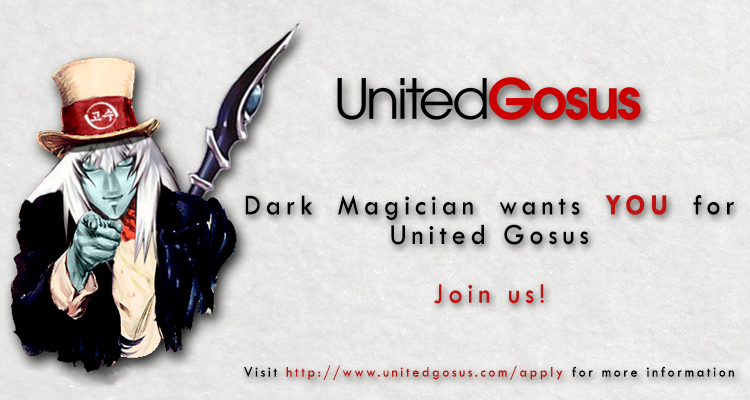 United Gosus is a reflection of the dynamic culture that makes up the Yu-Gi-Oh! Trading Card Game. Whether it is competing at Premier events or working behind the scenes, there is a position within UG for every aspect of that culture to grow. If you believe you have what it takes to make it through our highly selective recruitment process, then we encourage you to apply today. List of Membership Opportunities: (Open now!) 28/02/2018 !!! Note: Only very active People, who can effort to travel to all important events in the year such as almost all his YCS`s , his Nationals and unquestionable his Continentals and who can always effort to play the “best ” deck. Adobe Photoshop, Adobe Illustrator, Adobe Premiere or MacOS Final Cut Pro X and/or other Video/Photo Graphic App skills are welcome. Very good english Blog writing skills and being up to date with all YuGiOh trends/news required. For right now -> WordPress skills required. Just send us your application as PDF file to our official Facebook Page! We will respond as soon we can! For more information about our recruitment practices, click here.